Hello Mr. Pop Tart | Go Figure Girl! Would someone please tell me why, after many many years – many – of never having eaten a Pop Tart, I’m suddenly craving one? A toasted Strawberry one with frosting and sprinkles. Just a little brown around the edges and steaming hot in the middle. Just about right. I went to the grocery store tonight to get some eggs, almond milk and the like and there they were: Pop Tarts. I picked up the box to see if maybe I had perhaps remembered incorrectly that each pastry had 200 calories and over 15g of sugar a piece, but damnit, I was right. 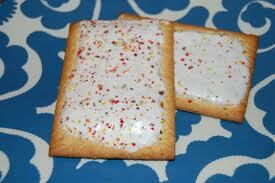 My next question to myself was: Could I use a Pop Tart as a post-workout insulin spiking treat? 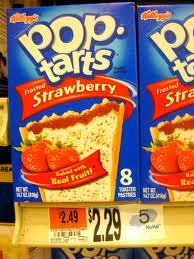 Instead of drinking Waxy Maize could I eat a frosted Pop Tart? It did not take too long for me to put the box back on the shelf (although I did compare the nutrition information between the frosted with the un-frosted version – you save 3g of sugar) and check out with no cheats except a 4-pack of sugar free pudding (which was really not that great, BTW). I should have opted for a Pop Tart. I’m a little weirded out because I’m not even in prep yet and I’m craving childhood treats. I think the last time I had a Pop Tart was in the 90’s. This entry was posted on July 3, 2012 by belcbody. It was filed under Uncategorized and was tagged with crave, cravings, diet, figure competition prep, grocery store, pop tart, pudding. Lol – I hear you – nut butter seems to be a weakness for everyone I know (including me). Three days away is not far to go! Go get it!! Stay tuned – I start cutting in about 2 weeks, so I’ll be posting more frequently – but hopefully less about Pop Tarts. Can’t wait to hear about your competition! Stay strong!